Hertog MG, Kromhout D, Aravanis C, et al. “Flavonoid Intake and Long-Term Risk of Coronary Heart Disease and Cancer in the Seven Countries Study.” Archives of Internal Medicine 155, no. 4 (February 27, 1995): 381–386. Barak V, Halperin T, Kalickman I. 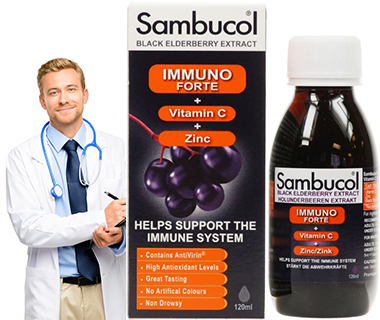 “The effect of Sambucol, a black elderberry-based, natural product, on the production of human cytokines: I. Inflammatory cytokines.” Eur Cytokine Netw. 2001;12:290–296. Zakay-Rones Z, Varsano N, Zlotnik M, et al. “Inhibition of several strains of influenza virus in vitro and reduction of symptoms by an elderberry extract ( Sambucus nigra L.) during an outbreak of influenza B Panama.” J Altern Complement Med. 1995;1:361–369. Shapira-Nahor B. “The effect of Sambucol on HIV infection in vitro.” Annual Israel Congress of Microbiology, February 6–7, 1995. Morag A, Mumcuoglu M, Baybikov T, et al. “Inhibition of sensitive and acyclovir-resistant HSV-1 strains by an elderberry extract in vitro [abstract].” Phylotherapie. 1997;25:97–98. Zakay-Rones Z., Thom E., Wollan T., et al. 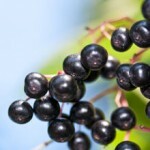 “Randomized study of the efficacy and safety of oral elderberry extract in the treatment of influenza A and B virus infections.” Journal of International Medical Research. 2004;32:132-140. Murkovic M, Abuja PM, Bergmann AR, et al. 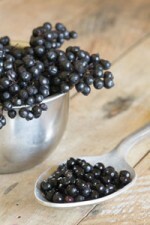 “Effects of elderberry juice on fasting and postprandial serum lipids and low-density lipoprotein oxidation in healthy volunteers: a randomized, double-blind, placebo-controlled study.” Eur J Clin Nutr. 2004;58:244-9. Hearst, Caroline, et. al. 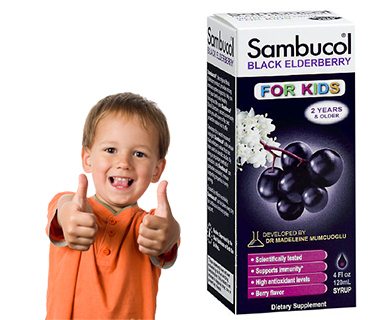 “Antibacterial activity of elder (Sambucus nigra L.) flower or berry against hospital pathogens.” Journal of Medicinal Plants Research 2010; 4(17): 1805–1809. Blochwitch M: “Anatomia sambuci, or, The Anatomy of the Elder cutting out of it plain, approved, and specific remedies for most and chiefest maladies: confirmed and cleared by reason, experience, and history.” London: H Brome and T Sawbridge; 1677. Grieve M: “In A Modern Herbal.” Edited by: Leyel, C.F. 2010. Wright CI, Van Buren L, Kroner CI, Koning MM. 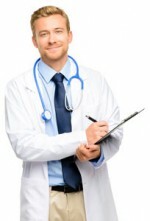 “Herbal medicines as diuretics: a review of the scientific evidence. “J Ethnopharmacol 2007, 114:1–31. Liu AL, Wang HD, Lee SM, Wang YT, Du GH. “Structure-activity relationship of flavonoids as influenza virus neuraminidase inhibitors and their in vitro anti-viral activities.” Bioorg Med Chem 2008, 16:7141–7147. Roschek B Jr, Fink RC, McMichael MD, Li D, Alberte RS. 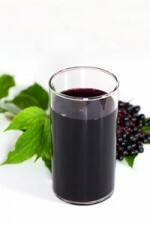 “Elderberry flavonoids bind to and prevent H1N1 infection in vitro.” Phytochemistry 2009, 70:1255–1261. Roxas M, Jurenka J. “Colds and influenza: a review of diagnosis and conventional, botanical, and nutritional considerations.” Altern Med Rev 2007, 12:25–48. Wu X, Gu L, Prior RL, McKay S. “Characterization of anthocyanins and proanthocyanidins in some cultivars of Ribes , Aronia , and Sambucus and their antioxidant capacity.” J Agric Food Chem 2004, 52:7846–7856. Netzel M, Strass G, Herbst M, Dietrich H, Bitsch R, Bitsch I, Frank T. “The excretion and biological antioxidant activity of elderberry antioxidants in healthy humans.” Food Res International 2005, 38:905–910. de Pascual-Teresa S, Moreno DA, Garcia-Viguera C. “Flavanols and anthocyanins in cardiovascular health: a review of current evidence.” Int J Mol Sci 2010, 11:1679–1703. Hay AJ, Wolstenholme AJ, Skehel JJ, Smith MH. “The molecular basis of the specific anti-influenza action of amantadine.” EMBO J 1985, 4:3021–3024. Kiso M, Mitamura K, Sakai-Tagawa Y, Shiraishi K, Kawakami C, Kimura K, Hayden FG, Sugaya N, Kawaoka Y. “Resistant influenza A viruses in children treated with oseltamivir: descriptive study.” Lancet 2004, 364:759–765.